Oregon photographer Robert Adams won this year’s prestigious Hasselblad Award. The Fraenkel Gallery in San Francisco hosted the award ceremony, only the third time the award has been presented outside of Hasselblad’s hometown of Gothenburg, Sweden. 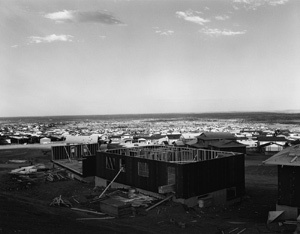 Adams’ work focuses on the American West. His 1974 book The New West looked at the changing landscape of Western states, documenting the creation of suburban landscapes in once pristine, rural areas. The photographs in this body of work helped define Adams’ style as a no-frills, descriptive documentary photographer in the tradition of Walker Evans. Over the course of 40 years as a photographer, Adams’ unflinching and unsentimental eye has captured the enviornmental transformations of the Western landscape — from forests hit by clear cutting and wide mountain landscapes to the rise of housing tracts, motels, supermarkets and trappings of suburbs. The Hasselblad Foundation gives the photography award each year to a photographer who has contributed significantly to the field and is one of the most significant prizes to be awarded for photography. The past winners list reads like a Who’s Who in Photography: Henri Cartier-Bresson, Ansel Adams, Susan Meiselas, Irving Penn, Richard Avedon, Robert Frank, Nan Goldin, Lee Friedlander, William Klien, Josef Koudelka, William Eggleston, and so on. Adams finds himself in excellent company. The winner receives a gold medal (usually presented by the Swedish royal family), a certificate and a monetary prize of 500,000 SKE.